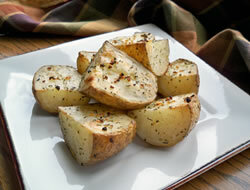 A flavorful roasted potato that is simple to make and goes well with most any meal. 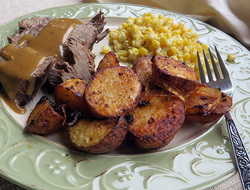 Peel potatoes and cut into large chunks; place in a shallow baking pan in a single layer. In a small bowl mix butter, olive oil and remaining ingredients; pour over potatoes and toss until well coated. Bake, uncovered, in preheated oven for 30 to 40 minutes turning occasionally to brown all sides. 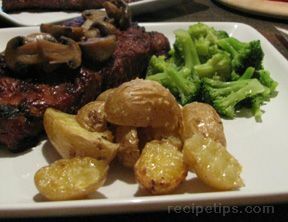 "These potatoes were simple to make and were very flavorful. I roasted them until they were nicely browned because we like them crispy. They would be good with gravy over them but they were also good with sour cream."